Solar Water Heaters are a great way to quickly reduce the cost of your monthly utility bill. We all need hot water on a daily basis, so why not make a green investment in your family or business's financial future? 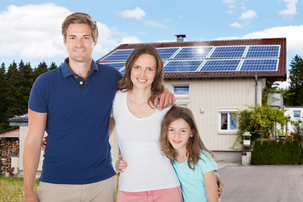 At Solar Volusia, we are the area experts in providing long-term, solar energy solutions that will increase the value of your home or business. Solar water heaters are an important part of that planning process, and our technicians can come to your home or business and provide you with a free proposal to start saving money today on your heating bill. Our water heaters are the highest quality in the industry, yet affordable and always dependable. Solar hot water systems can reduce your water heating costs from 75-90%, and will pay for themselves in as little as 3 years. The average return on investment for solar water heaters is 3-6 years. Solar water heaters also qualify for the 30% Renewable Energy Federal Tax Credit from the federal Department of Energy, as well as various rebates from local utility companies. The combined effect of federal incentives, local rebates, and reduced cost from the manufacturers results in more and more affordable systems that will got to work and save your family money by using the sun to heat your water. The way these solar hot water heating systems work is quite simple. The panels are installed in a location that results in the highest exposure to the sun, and when water passes through the panels, it is heated and then returns to your home. The hot water is then ready to be utilized by your family. One of the biggest benefactors of Daytona Beach solar water heaters is our precious earth. This is because traditional electric water heaters emit up to two tons of carbon dioxide emissions into the atmosphere each year. Solar water heaters from Solar Volusia emit no toxic greenhouse gas, but instead are a clean energy source that uses mother nature to warm you home or business's water. Solar Volusia will install your solar water heaters in Daytona Beach, FL, as well as Port Orange, Palm Coast, Ormond Beach, New Smryna Beach, and the greater Volusia County area. Call Solar Volusia today at 386-319-5777 for a free estimate for a solar water heater, as well as an overall energy analysis on your home or building. Start saving today!